Another team that (for some reason) is kinda hard to find online. It took awhile to find a Mariners program, and it wasn't that cheap. 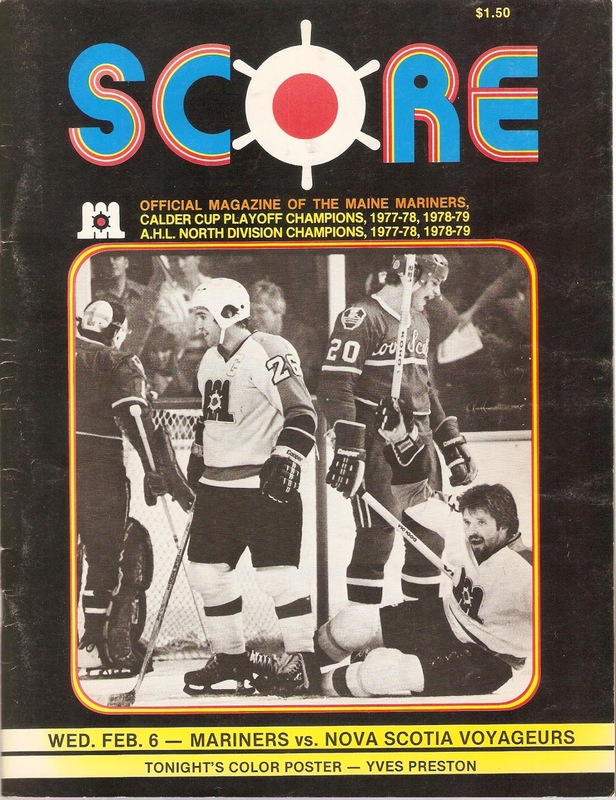 The Maine Mariners joined the American Hockey League for the 1977-78 season. They played their home games at the Cumberland County Civic Center, a 6,733-seat arena in Portland, Maine. The franchise was owned by Ed Snider, owner of the Philadelphia Flyers, and was the Flyers' primary affiliate. Bolstered by the Flyers' prospects, the Mariners were a powerhouse in their first two seasons. They finished first overall both years and won the Calder Cup as well, the only time an AHL team has accomplished that feat. The Mariners were coached by Bob McCammon, who previously coached the Port Huron Flags of the IHL and had a brief stint with the Flyers in 1978-79. After two straight dominant seasons, the Mariners slipped to third place in the North with a 41-28-11 record. Their 93 points tied second-placed Nova Scotia, but the Voyageurs took second with two more wins. They were just three points behind first-place New Brunswick, and 18 ahead of fourth-place Adirondack. Fans poured into the Civic Center that season, as the Mariners averaged a league-best 5,416 per game. The Mariners scored the fourth-highest amount of goals in the AHL that season, lighting the red light 307 times. They were led by Gordie Clark, who scored 47 goals and 90 points on the year. Seven other players (including Dave Gardner, who was traded to Binghamton) scored 20 goals or more that year. On defense, the Mariners were tops in the league, surrendering a league-low 266 goals. Maine's two top netminders were Rick St. Croix and Robbie Moore. St. Croix played in 45 games that year, and had a nice 25-14-7 record, with a 2.92 GAA and 1 shutout. Moore responded by getting into 32 games, with a 14-11-4 mark, a 3.51 GAA and 1 shutout. Sam St. Laurent, Dave Settlemyre and future NHLer Bob Froese also saw playing time. The two-time defending champs were looking for a three-peat in 1979-80, and drew Nova Scotia in Round One. The Mariners pushed aside the Voyageurs in six games to advance to the semi-finals. Their run would end there, as New Brunswick would dethrone Maine in a tight six-game series that saw two games (including the clincher) go to overtime. Nice program. This one has 80 pages, mostly in black-and-white, but there are quite a few color pictures and ads. Some of the ads include Schlitz Beer, Zenith and the 1980 Chevrolet Caprice (which apparently was part of the "Team of the '80s" with the Mariners). That night's opponent was the Nova Scotia Voyageurs, Montreal's farm team. The Voyageurs featured future NHL goalies Rick Wamsley and Richard Sevigny as well as future NHL goon Chris Nilan. Aftermath: The Mariners would continue on as the Flyers' farm team until 1983-84, when the New Jersey Devils bought the team. Maine would win the Calder Cup that year, but declining attendance would force the Devils to relocate the franchise to Utica, New York, for the 1987-88 season. The AHL immediately placed an expansion franchise in Portland for that season. The new team would also be called "Maine Mariners" and assumed the original franchise's logo and history, but would don the black, gold and white of the new parent club, the Boston Bruins. The new Mariners had one winning season in five years and attendance dipped below 4,000 per game by the time the Bruins moved the team to Providence, Rhode Island in 1993. Portland got it's third shot at AHL hockey when the Baltimore Skipjacks moved to town after the Mariners left. The new Portland Pirates won the Calder Cup in 1983-84, and still exist to this day.